I'm off to France for 5 days to see my Dad. Behave children won't you? I shall bring back some tinned moules marinieres and some tight-fitting dayglo espadrilles for each and every one of you. I will have no internet access at all (OHMYGOD - how am I going to cope?) I will have no landline, no phone signal and apparently no gas. It is a little adventure. I have taken a tent in case 'the barn' which last time I heard didn't have a roof still doesn't have one...depeche toi...mais oui mais oui.....une baguette sil vous plait....le singe est dans l'arbre...Yvette est dans le salle a manger...zut alors! My French is astounding. What a bloody corker of a track this is. 1989. On 33. Stereo MC's. One of my favourite bands ever. I always thought Rob looked a bit wispy and scary in a really stoned sort of way. He has very unhealthily sunken cheeks. This sort of music inspires me to another podcast. 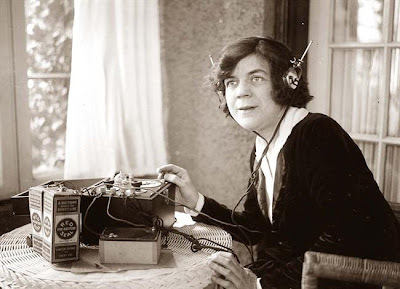 Sharpen your ears dears - there is one in the making....for now you will have to regress with this. I had a great time in my Stereo MC days - it's all a bit hazy now - like really smoky and sweet-smelling - aaahhh those were the days. Don't forget to vote! I have slipped to just outside the Top 50 downloads which simply will not do. Please spread the word of The Rockmother. You know it makes sense. 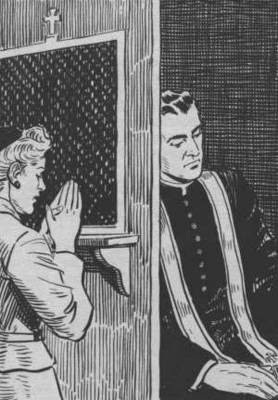 Oh dear - I really must revive my flagging blogposting-ness. I've been far too busy fending off 54 unwanted Hold'em Poker requests and Compare Your Friends Pants surveys on c*ntbook to even get time to concoct a blog post. I've even been enveigled into playing Scrabble at 08:00 of a morning and once been late to take the ginger Squidget to school as a result of feverishly 'trying to place my bingo!'. For those not in the know of really important online things such as Scrabularse - that's when you score 80 points with one word. All I got was a request to fill the late book and a bit of a scowl from the school receptionist. Cow. I made a purchase this week. I made a ridiculous purchase this week. I made a purchase so thoroughly ridiculous that when I described it to my friend Thom yesterday he genuinely snorted like a pig. I knew he wouldn't understand - he was born in 1982 for god's sake. Anyway, back to my story. Are you sitting comfortably? (You will need to sit down - just warning you). Now I'll begin. 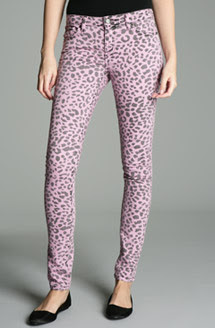 Pink and black faded leopard print very very very tight jeans. If you can imagine the picture above is really a much shorter 3-dimensional plasticine model and if you squash it a bit with your hand so it splurges out the sides and looks a bit fatter - that's what I look like in them. Actually, not that bad but not quite svelte 13 again that's for sure. I had a 'hang on, do I look a bit mutton in them moment - for about a millisecond - and then in a fit of revisited teenage fever I bought them. So far - I have worn them in the changing room of the shop twice (you see - I really did have to convince myself) and once in the bathroom at home. I was thinking recently that I should probably try and lose half a stone. I have done a lot of running in my head but so far not any real life running. I was sort of experimenting with the idea of whether I could indeed think myself thin? I bought the trousers thinking that they would be the catalyst for a rigorous self-induced weight-loss programme but rather fantastically because they are so tight they squidge everything cleverly re-distributing here and there and I actually don't look that bad in them at all. Goodness knows when I shall wear them but I shall. In the continuing absence of a Listen With Rockmother podcast please listen to this instead - it is much better than anything I could ever dream of doing and was originally broadcast on 12th October 1976 - I remember exactly where I was when I first heard it. We made sure we stayed in especially. And if you are still with me - check out this man - a one true diamond of this hard cold world. I had the absolute pleasure of working and talking with him yesterday. I am very lucky. PS: blogger is rubbish and has decided that everything shoud be in italics even though I keep telling it not to. Goodness, Agnetha looks reaaally pissed off doesn't she? I can sort of see why. What on earth were they thinking of? 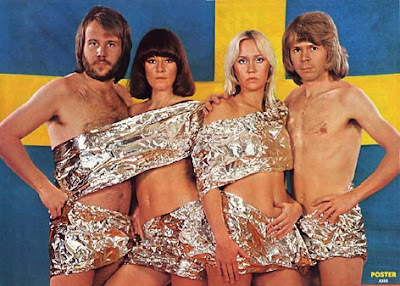 I know - let's wrap ourselves in a continuous strip of Bacofoil and stand in front of the Swedish flag - it'll look really good I promise. Do you think they used a whole roll? And do you think they went 'commando' or were they wearing pants? I wonder if they recycled it for a slap up barbecue after the shoot? It's the Wimbledon Men's Final tomorrow - yaaaaawnnn - Geoff has written a great piece on the demise of tennis due to that hateful extra inch. I wholeheartedly agree with him and would rather watch this - it is infinitely more entertaining. 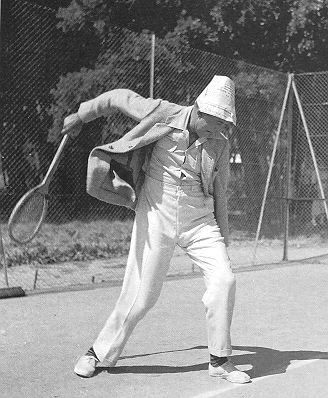 Check out the serve action. Toodlepip. Sayonara. Kalimera. Adios. Night night. Good morning. Hello. Bye. Later. Rather scarily my hard drive is nearly full. This is mainly due to the fact I have nearly 6000 photo's stored in my iPhoto. 6000!? I know - and most of them are of my son or his things (see above) or really unflattering ones he has taken of me whilst I'm driving the car or extreme close ups of my bottom as I am bending over in my bikini on holiday - horrendous . And I have a lot of music stored too. Big hefty files. So I bought an external pocket drive. Today I transferred all my photo's across to it which means I can now delete the originals on the hard drive in order to free up space. Yes. That makes perfect sense. Even though I know and can see that all of the photo's have transferred successfully to the external drive I can not bring myself to delete the originals clogging up the hard drive. I just can't do it. I have a mortal fear of something going wrong and losing the photo's forever. I am a true idiot. A dolt. A silly bird. So I'm going to take it into work on Monday and embarrass myself further by showing it all to an IT person and sit there while they look at me pretending not to show that they think I am a total moron whilst convincing me that it really is absolutely fine just to delete the files. All 8GB of them. But before I do - here are some I took today of the Squidget and a balloon that we drew a face onto and released. Well, it's better than watching telly or pulling wings off flies or doing sensible things like deleting files you don't need anymore because you have just made a perfectly good back-up copy.